A POA Revocation Form is a legal document which you can use to terminate, revoke or cancel previously Power of Attorney that was previously granted. A Power of Attorney can be revoked at any time, for any reason provided the Principal is mentally capable. The Revocation of Power of Attorney Form (Revocation of POA) must be a in a written format and signed by the principal in front of a Notary Public and copies must be given to the “attorney-in-fact” or “agents” and also to any financial institutions where you have previously submitted the previously signed power of attorney granting any powers. When do I use a Revocation Form? When you want to cancel or revoke a previously made power of attorney. When you want to appoint a new “attorney-in-fact” or “agent” and revoke the the rights granted to your previous “agent” or “attorney-in-fact”. Do I need to Record a POA Revocation? 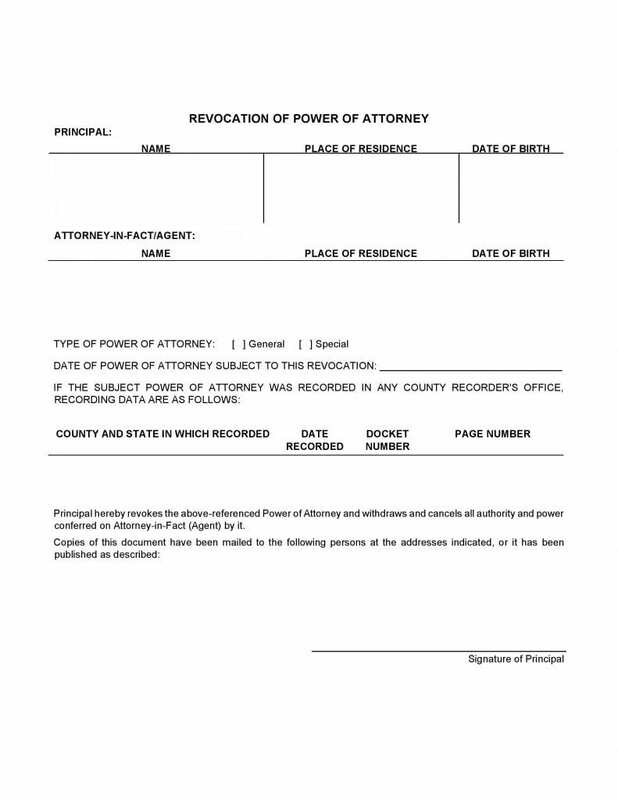 If you have recorded your previously prepared Power of Attorney at the recorder’s office in your county, you will have to record this Revocation form at the same office. A Revocation Form can revoke all power of attorney forms regardless of it being a General POA or a Durable POA or a Medical POA etc. You may use a General Power of Attorney Revocation Form or Download a state specific revocation form from the table below. Since this is a general or more specifically a Blank Revocation Form this can be used in any state, provided the state does not require you to have a specific revocation form. A revocation form is used when you no longer want your “agent” or “attorney-in-fact” to make any decisions on your behalf. Once you revoke a power of attorney you can also make a new one to appoint a new “attorney-in-fact”. Principal Details : Enter the Principal Name, Address and the Date of Birth. Attorney-in-fact / Agent Details : Enter the Agents Name, Address and the Date of Birth. Mark a Tick on the type of Power of Attorney the one you are trying to revoke is, whether it is a General or Special. Enter the Date of Power of Attorney subject to the one you want to revoke. If you have recorded the power of attorney in a county recorder’s office enter the recording details in the given section. You (principal) then needs to sign in the given space. The second page is notary information page and where you first write your Name (If you are the principal), followed by the date and then Sign It, when you you sign you confirm that you are signing the revocation form on your own will and not under any influence. Your witness has to enter his name followed by the date and then sign in front of the Notary Public of your State. The Notary Public of your state enters the details as required, then sign it and seal it. Once this is done all you need to do is, make copies of the Revocation form and handover the one copy to your Attorney-in-fact and then send the copies to all the financial or medical institutions you had given the original power of attorney form to depending on the type of POA it was.